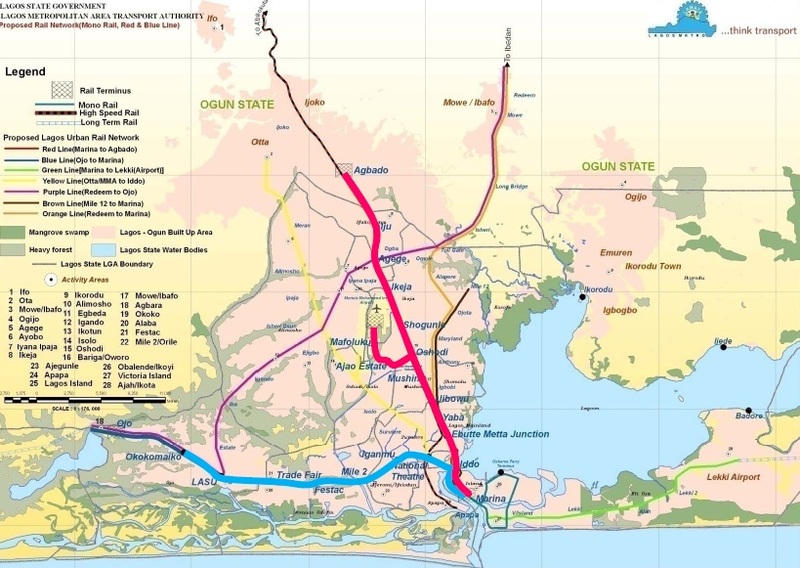 LAGOS- The Lagos State Government November 13, 2013 announced the award of a contract for the extension of the light rail (blue line) that would start from the National Theatre, Iganmu and terminate at Marina. Managing Director, Lagos Metropolitan Area Transport Authority (LAMATA), Dr. Dayo Mobereola, told journalists yesterday in Lagos, that the Governor, Mr. Babatunde Fashola (SAN), had awarded the contract to the China Civil Engineering Construction Corporation (CCECC). “All over the world, the light rail system is done in phases and that is one idea we have copied in this regard. For instance, it took 22 years to complete one line in New Delhi. It also took 18 years to complete the one in Jakarta. Even in Dubai, it took the UAE eight years to complete it and it was done in phases,” he added. Mobereola, who spoke on the subject, ‘LAMATA at 10: Challenges, Successes and Prospects’, also said the Bus Rapid Transport (BRT) system introduced 10 years ago, had exceeded the agency’s projection. He explained that before the BRT was introduced, the agency had projected it would transport 60,000 passengers daily, but now it transports over 200,000 passengers daily. Gradually, according to him, Lagos residents have been abandoning ‘danfo’ and ‘molue’ buses for BRT. “We have been reducing waiting time at bus stops, the travel time within the metropolis and we equally have reduced transport fare by 40 per cent compared to the service being rendered by yellow painted buses,” he added. He said the introduction of electronic ticketing system had replaced the previous paper ticketing system, adding that the agency would soon introduce Lagos Connect Card, to make it easier for commuters in the state to use aboard train, ferries and buses. “It is something we have been worried about for some time now. It has been a challenge, no doubt. But we did not sit down and fold our arms on the issue. LAMATA has been training and retraining the operators of the buses. Additional 50 buses will soon be introduced to replace those that are no more roadworthy. “We have developed a 20-year development program. We believed Lagos needs seven rail lines. We are in the process of starting the Red Line rail project that will run from Alagbado in Ogun State to Marina. “We believed the state still needs 9 BRT routes. 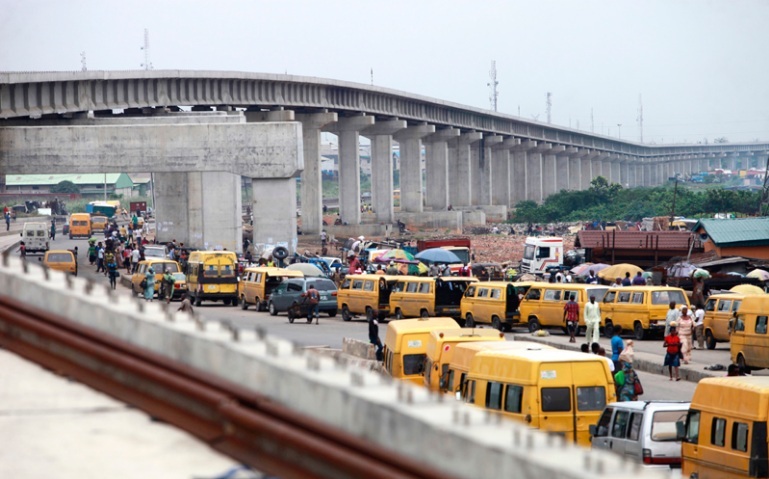 We are talking with the state government to ensure commercial centers are put in place on the mainland to reduce the number of people travelling to Lagos Island daily,” he said. 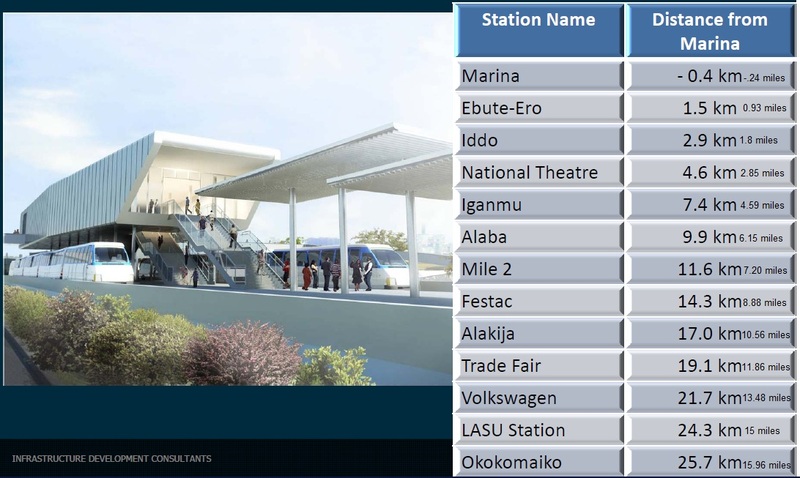 The Lagos State Government is working towards launching the first phase of the Okokomaiko – Marina (Blue Line) Light Rail Mass Transit for operation early 2014, Managing Director, Lagos Metropolitan Area Transport Authority (LAMATA), Dr. Dayo Mobereola has disclosed. 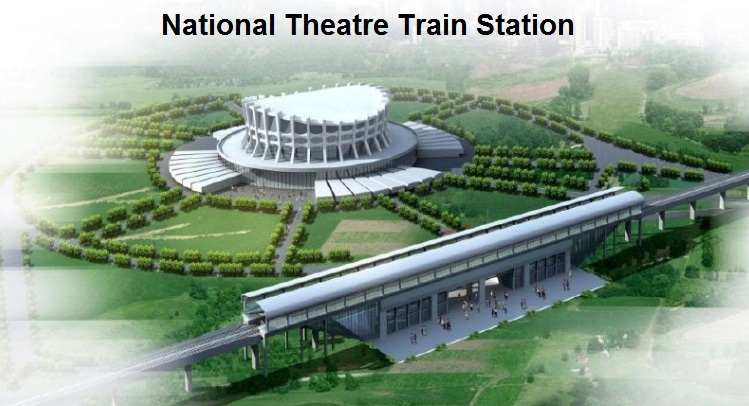 “The first phase is between National theatre and Mile 2; that was actually awarded in 2010 and we are hoping that by 2014 that phase will be finished and then move on from Mile 12 to Okokomaiko and then come back to National Theatre to construct the infrastructure to Marina,” he said in an interview. The first phase, from the National Theatre, Iganmu Lagos to Mile 12, is a seven-kilometre distance with stops at Iganmu, Alaba and Mile 2. Dr. Mobereola said due to the huge capital outlay, construction of the rail project was divided into three phases, the first of which is the survey, design, preparation of construction yard and the rail infrastructure between National Theatre and Mile 2. “The good thing is that we have a contractor has been building new Railway system for the past 50 years in their country and other places, they know how to build a very good rail way system and the quality is commendable, it is very good and we are quite happy with it,” he added. Dr. Mobereola stated that the rail project was being implemented under a public and private partnership: the state is building the infrastructure while the private sector will provide the rolling stock and management. 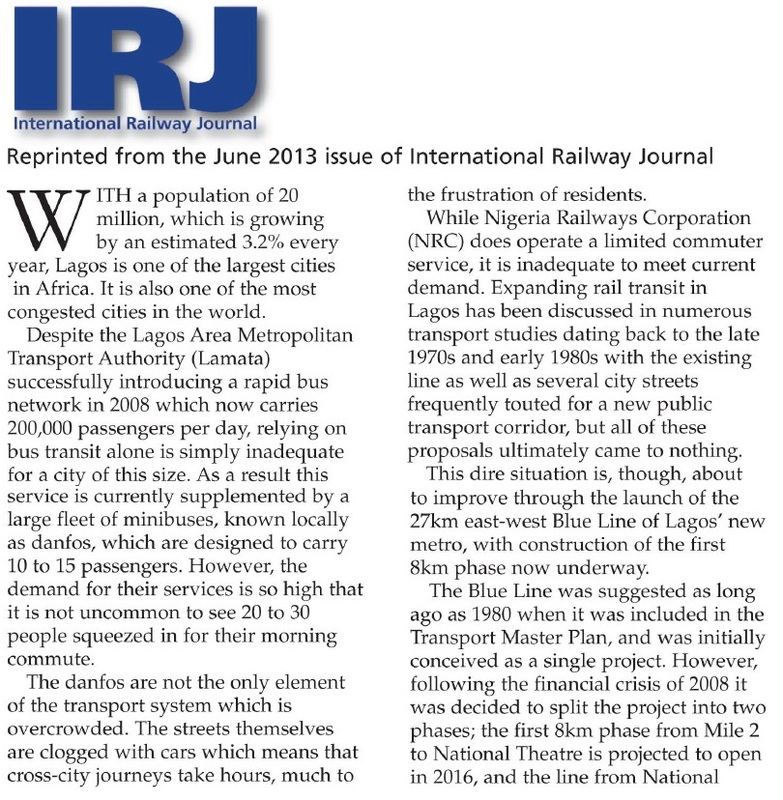 Update May 2013- Lagos Light Rail Project was delayed for 6 months. Lagos State Commissioner for Works and Infrastructure Obafemi Hamzat stated that the Nigerian government suspended the project when it discovered that the contractors planned to import thousands of skilled artisans from Togo, due to shortage of skilled artisans in Lagos. 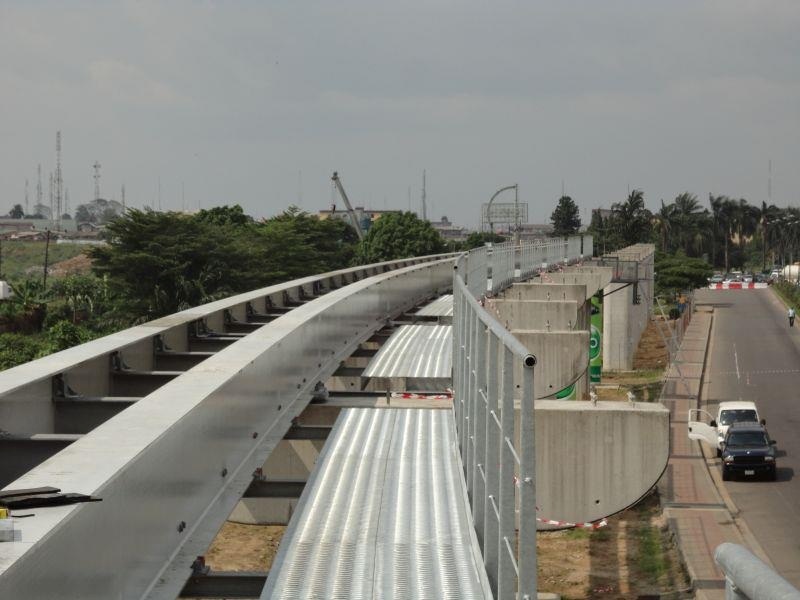 The Lagos State Governor Babatunde Fashola on Tuesday, January 8, 2013 said the first phase of the state Blue Light Rail project would be completed by June this year(2013). 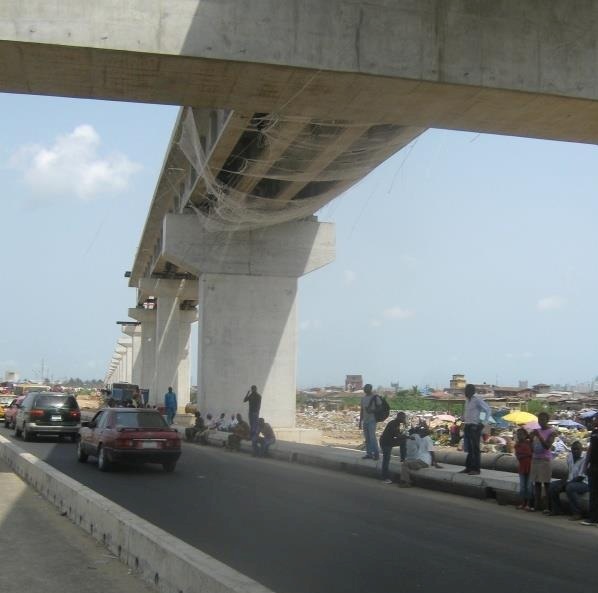 He expressed confidence that Lagosians would start enjoying the services of the light rail project immediately. The first phase would run from Marina and terminated at Okokomaiko area in Ojo Local Government. Fashola spoke during an inspection of ongoing projects in the state which took him and his cabinet members to Orile-Iganmu, Alimosho and Ejigbo areas among others to assess the level of works being done by contractors. He said, “In order to finish the project, the contractor did not go on vacation during the festive period. This will ensure that the project is delivered on time for the use of Lagosians. “The first section of this rail, which started from National Theatre, Orile-Iganmu to Mile 2 Bus Stop, would be fully completed with the tracks laid. “Construction work will continue on the project from Orile-Iganmu to Marina, the expansion work on the road from Mile 2 to Okokomaiko will also be intensified. “This is what we do with the loan collected by the government. We don’t use our loan to pay salaries and other recurrent expenditure, what we do with our loan is to provide capital projects that would serve the residents. Fashola also explained that the factors that necessitated the slow pace of work in Ago Palace Way, Okota, Isolo had been removed as owners of properties on right-of-way, who went to courts to stop the government from demolishing their properties, had agreed to an out-of-court settlement. Fashola assured the residents that with the owners agreeing to accept compensation from the government, the pace of road construction in the area would be faster. He said, “The community has grown, so we have to expand the road. At Ago Palace Way, some of the properties needed to give way; everybody wants good road, but nobody wants it to pass through his house, so some of the owners took us to court. But we have settled out of court and we need to pay compensation. He said works would be accelerated to complete the expansion of the road expected to serve as a link between Okota and Festac areas. 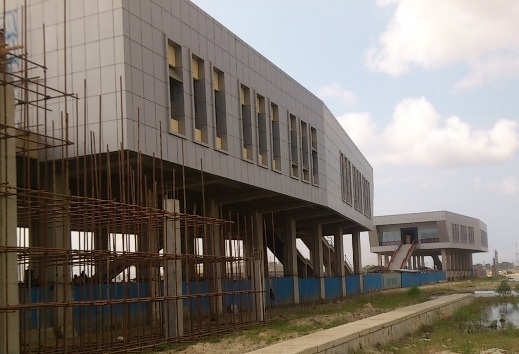 The Lagos State Government, through its authorized representative, LAMATA, is developing an extensive urban rail system for Lagos, Nigeria’s commercial capital. The first two lines being developed are the Red Line and the Blue Line. LAMATA is committed to developing both using a public private partnership structure. LAMATA is currently tendering a design build contract for fixed infrastructure and a 25 year concession for operations and maintenance. Interested parties are encouraged to read about these projects on this website and to attend Investor Forums being held in Lagos, Dubai and London. Lagos is the largest city in Nigeria and is the country’s most important commercial center. With an estimated population of over 17 million people, Lagos ranks among the most heavily populated cities in the world. From a small colonial town in the early 20th century, Lagos has now grown into a large metropolis. This dynamic city has experienced rapid urbanization and has lacked sufficient parallel infrastructure development. The vast number of motorized vehicles in the cities plagues the streets, causing tremendous congestion and increased air pollution. The recent implementation of a bus rapid transit (BRT) system has proven to be highly successful. 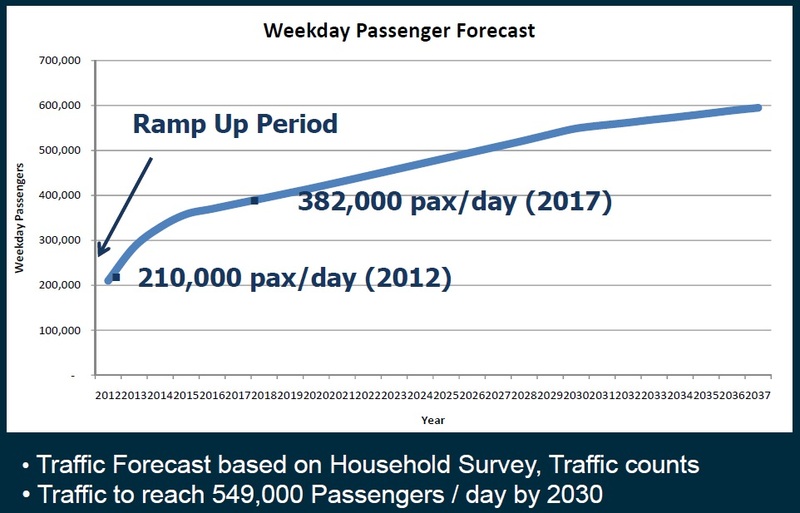 With estimated daily ridership at more than 180,000 passengers, the system has already surpassed expected passenger levels. 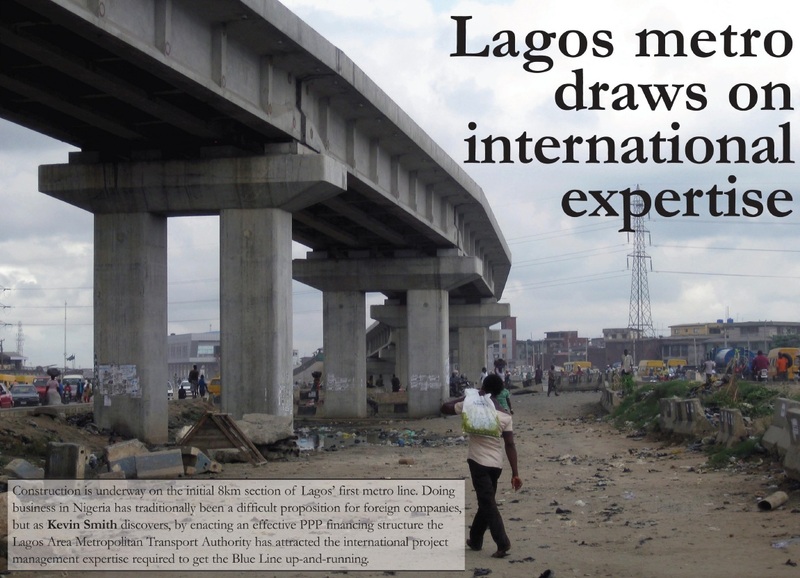 The BRT system was implemented by LAMATA on a public private partnership (PPP) basis. 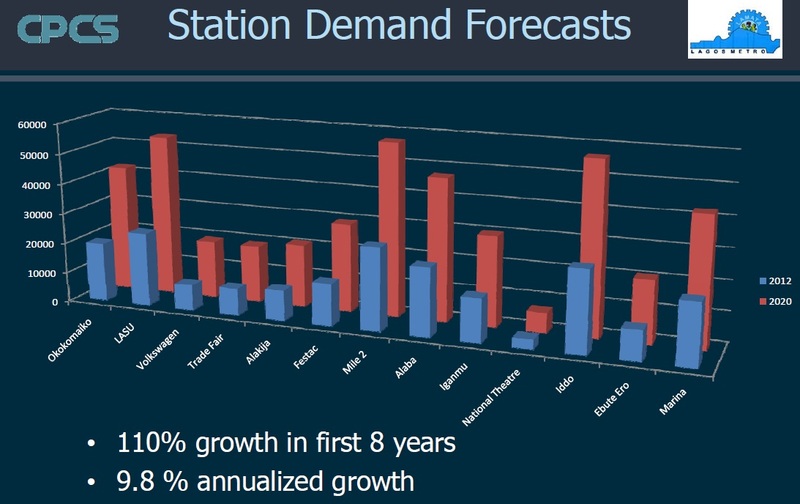 However, there continues to be a need for significantly more urban transport capacity. 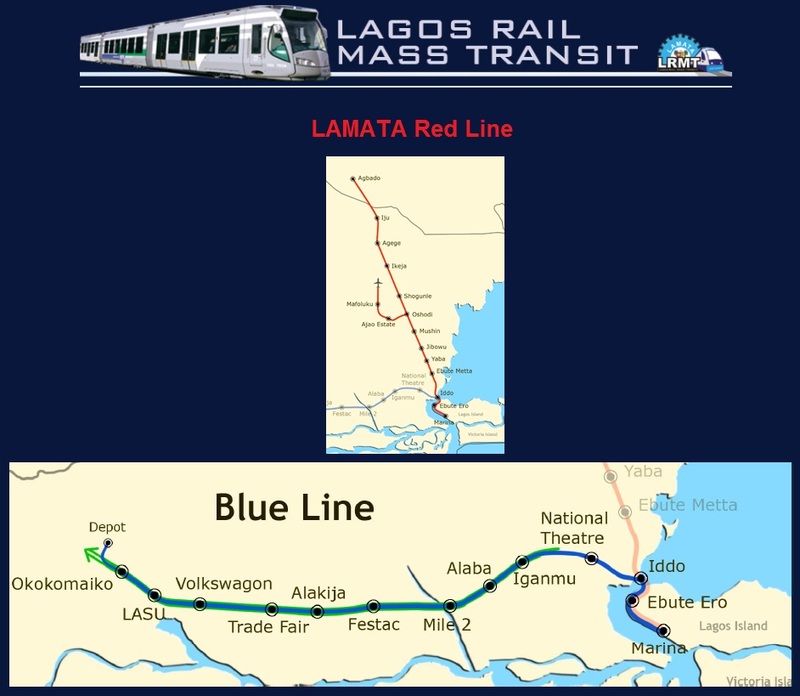 LAMATA has developed a conceptual framework for rail mass transit system that would provide passenger rail services on the most heavily travelled corridors in Lagos. The first two lines being developed are the Red Line and the Blue Line. Both lines will be developed on a PPP basis, with the Lagos State Government providing all rail and station infrastructure. The private sector will be invited to operate the system under a 25 year concession structure. Design and construction is expected to commence early in 2009. 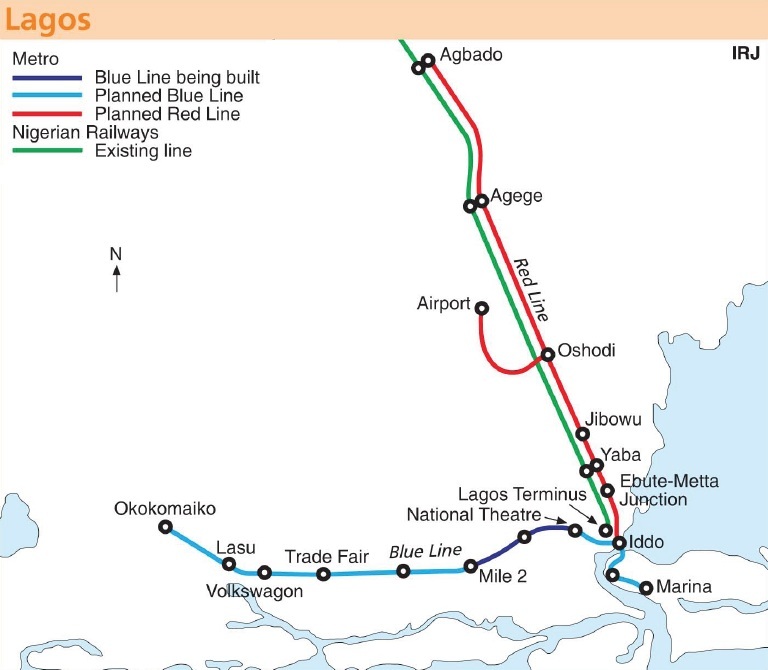 The Blue Line will run 27km (16.7 miles) from Okokomaiko to Marina, one of the most densely traveled corridors in Lagos. The rail infrastructure is being developed in conjunction with the Badagry Expressway project, a proposed toll road running from Lagos to Badagry. 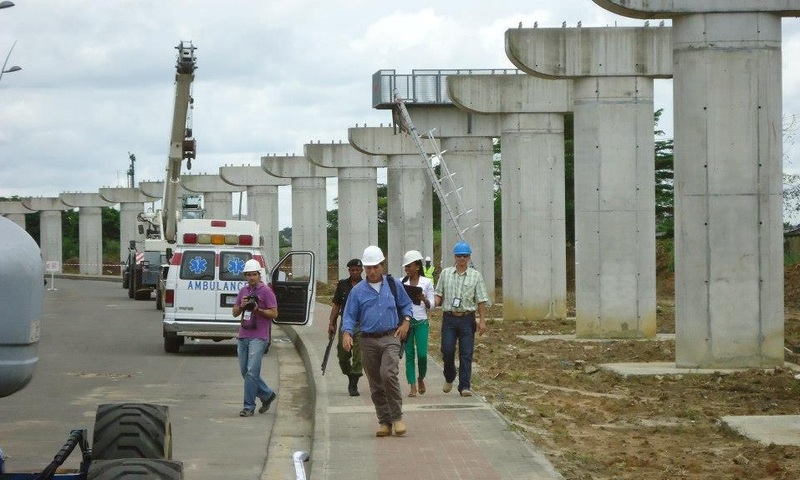 The Blue Line will run on an exclusive 15 meter (9.32 mile) right of way in the middle of the expressway. In total there will be thirteen stations, three which will be shared with the Red Line system. 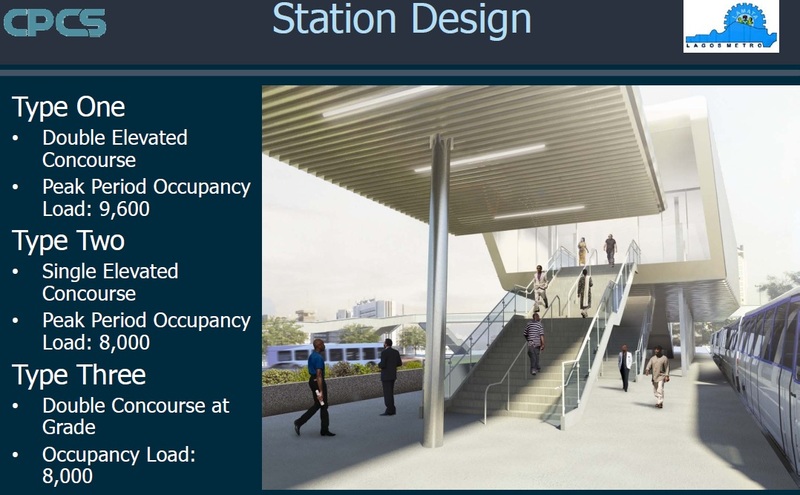 The stations will be located above the tracks, with large pedestrian walkways crossing the expressway. Large, concrete barriers will be placed between the rail lines and the expressway to ensure no external factors will disrupt service. The Blue Line system will require the construction of two bridges. The larger of the two, to be shared with the Red Line, will connect the mainland with the island. The second bridge will be across the river at Mile 2. The fixed assets, including construction of the alignment, bridges, and stations, will be wholly funded by the Lagos State Government. A concessionaire is currently being sought to procure and finance rolling stock and depot facilities, as well as provide operations and maintenance over a 25 year period. The concessionaire will be compensated through passenger revenues as well as revenues earned from retail activities within stations. 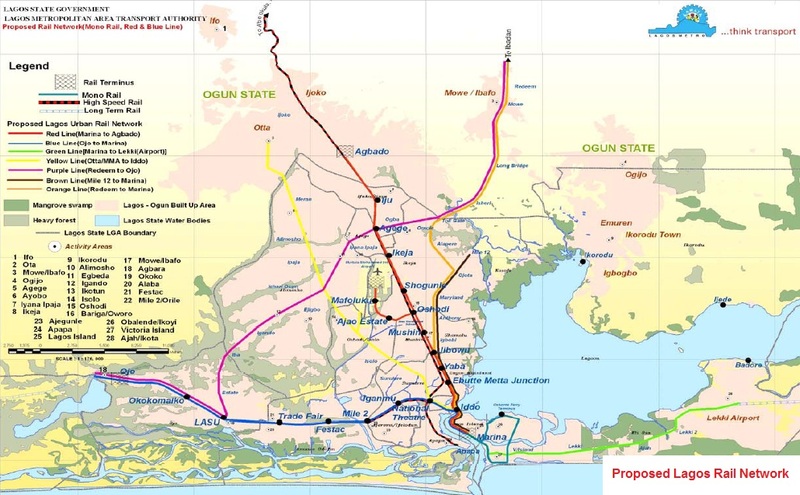 The Red Line rail system is being developed on North-South axis through some of the most densely populated areas in Lagos. Beginning on the island, the Red Line will run north to Agbado through a total of 13 stations. From the Marina to Iddo stations, the Red Line will share the alignment with the Blue Line. The shared infrastructure in these portions will be constructed as part of the Red Line project. 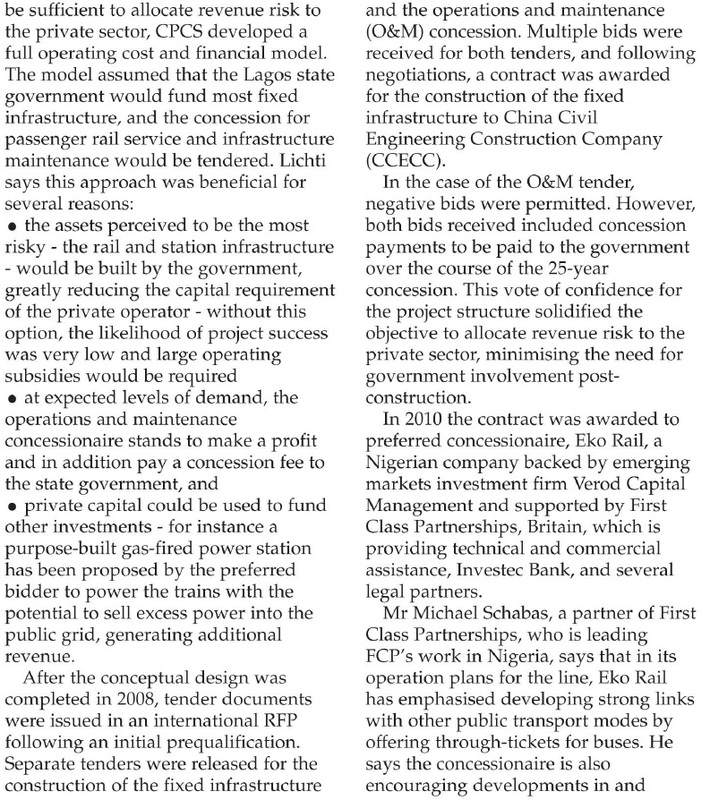 From Agbado to Iddo, the Red Line with utilize the existing Nigerian Railways Corporation (NRC) corridor. 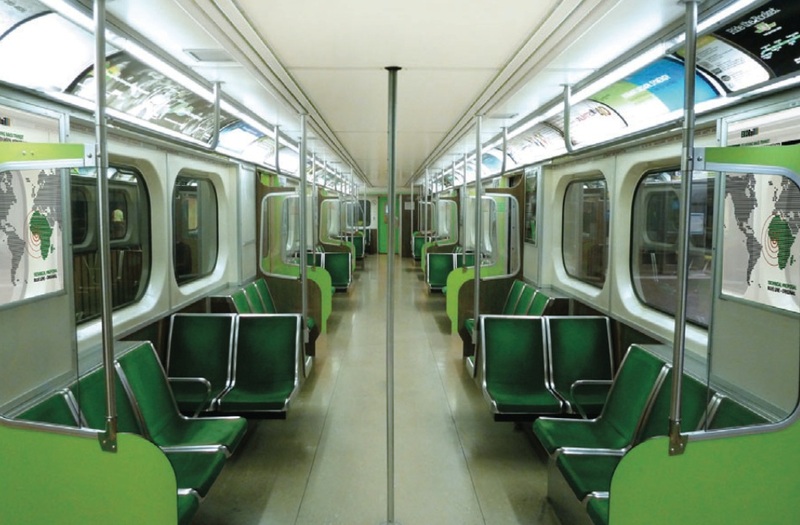 Eko Rail has begun taking delivery of modern, lightweight air conditioned trains formerly used on the Toronto Subway. These cars are now being refurbished prior to shipment to Lagos. Nigerian company, Eko Rail, has agreed to purchase 255 of the Toronto Transit Commission’s (TTC) 15-year-old H6s model subway cars from the Toronto Transit Commission (TTC) on the Lagos Blue Line mass transit systems. 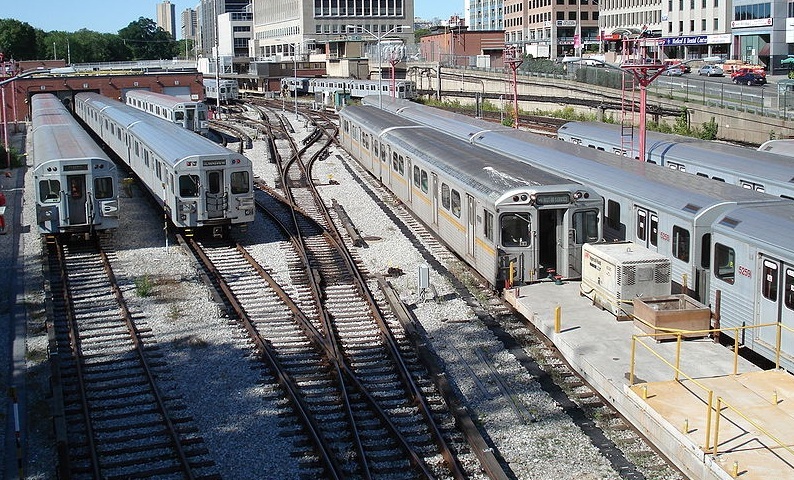 In December 2010, the City of Toronto launched its new fleet of subway cars that will replace the existing ones. 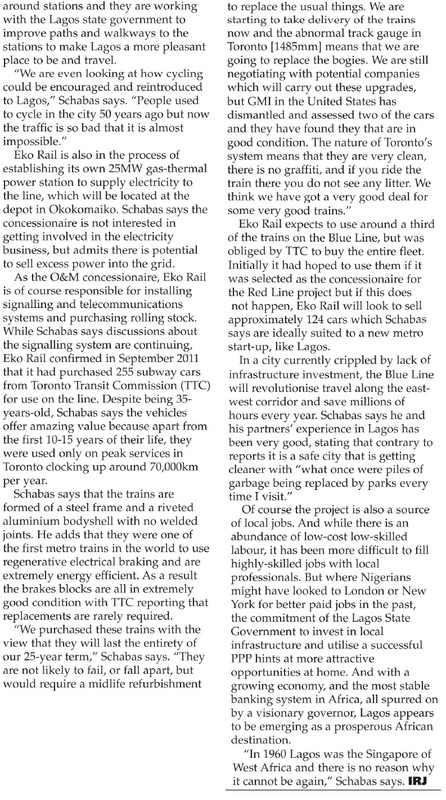 The city of Lagos is opting for the Toronto used trains due to the high cost of buying new ones. Subway cars, equivalent of trains, are series of connected railroad cars used for intra city (urban) transportation, usually underground and operated by electricity. The interiors of the cars will be refurbished and they will be converted to run on international track gauge, said London, England-based Michael Schabas, who is working with Eko Rail, the company expected to operate the Lagos line. Eko Rail is entering into an innovative public-private partnership with the government of Lagos State to equip, operate and maintain the Blue Line for 25 year. Verod Capital Management, an investment and advisory boutique focusing on Nigeria and West Africa. First Class Partnerships, rail strategy and operating advisors. Team members have had leading roles in railway projects around the world. Investec Bank, financial advisors. They have raised billions of dollars to fund rail and metro projects around the world, usually under some form of Public Private Partnership. Udo Udoma & Belo-Osagie, Nigerian lawyers with international project finance experience. URS (formerly Scott Wilson), engineers and project managers, with Nigerian and international experience building railways, metros, and electric power generation. Steer Davies Gleave, leading international transport planners with experience developing investment-grade traffic and revenue forecasts for privately-financed rail projects. Larue Projects develops and invests in infrastructure projects in West Africa. Larue is co-sponsor of the Lekki Concession Company, rebuilding and expanding the 50km (31 miles) Lekki Expressway under a 30 year concession. 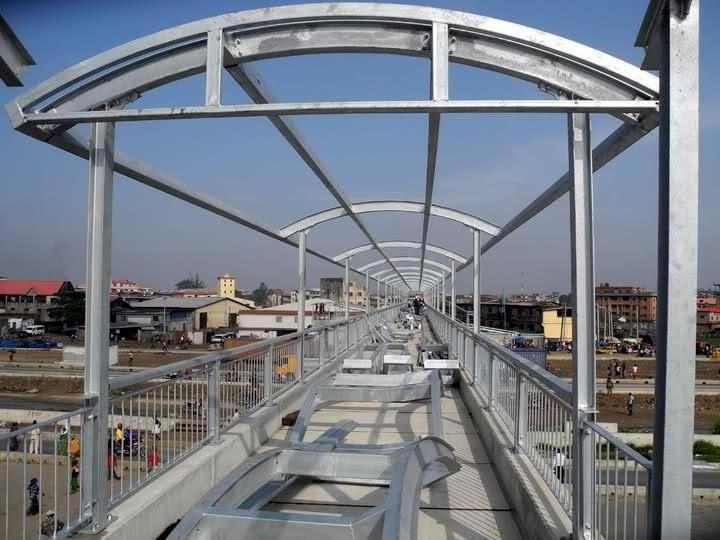 For the first time in the history of Nigeria, a cable car company, Ropeways Transport Limited, is set to launch a cable car mass urban transit system in the nation’s commercial capital, Lagos. This followed the signing of a 30-year Franchise Agreement between Ropeways Transport Limited, the Lagos Metropolitan Area Transport Authority (LAMATA) and the Lagos State Government recently. 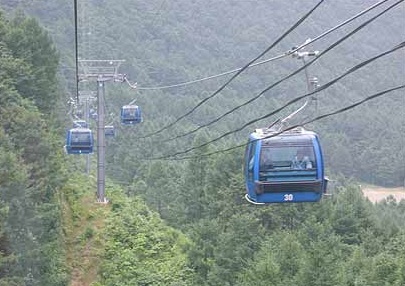 Under the terms of the Agreement, Ropeways Transport will this November begin the construction of towers, stations and connecting network cables along various routes covered in the first phase of the project, namely, Ijora – Iddo, Iddo – Adeniji, Apapa – Oluwole, Oluwole – Adeniji, Adeniji – Obalende, Obalende – Falomo, and Falomo – Victoria Island. 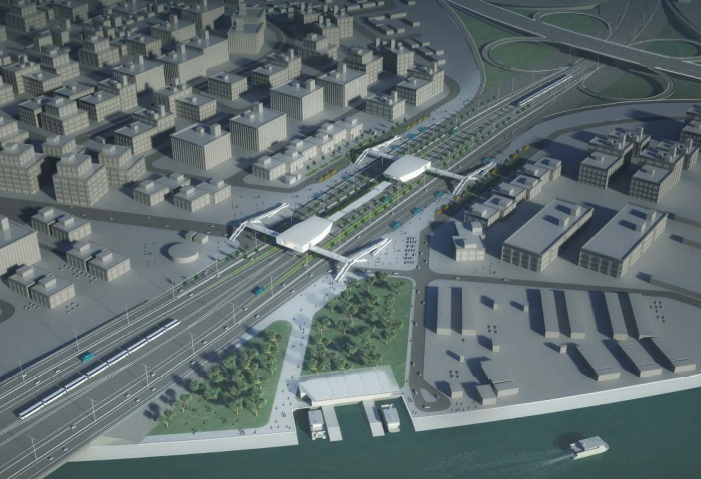 The project is expected to be fully completed and commissioned by early 2015. On October 13, 2009, the Rivers State Government, ably represented by the Executive Governor, Rt. Hon. 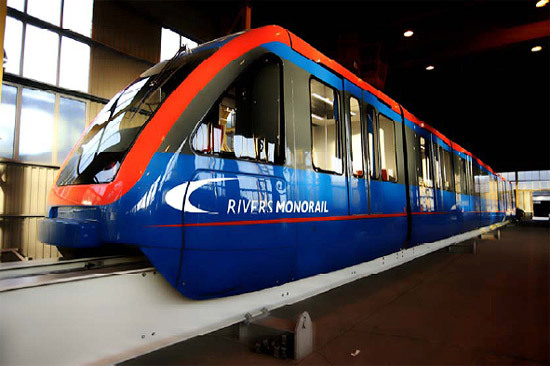 Chibuike Rotimi Amaechi and TSI Property and Investments Holdings Limited signed an agreement signaling the start of work on a monorail system to be hereby known as “Rivers Monorail” in Port Harcourt. The Rivers Monorail will be using the Intamin P30 Monorail Train, an electric driven train especially designed and most suitable for commuter services in cities. It is the most recent model of its kind and characterized by modern design, spacious cabins and is equipped with large size door openings for easy access for passengers with luggage. The visual impact of the train, the track beam (which it rides on) and the supporting columns will be minimal and an appropriate color will be chosen to help integrate the system into the environment. 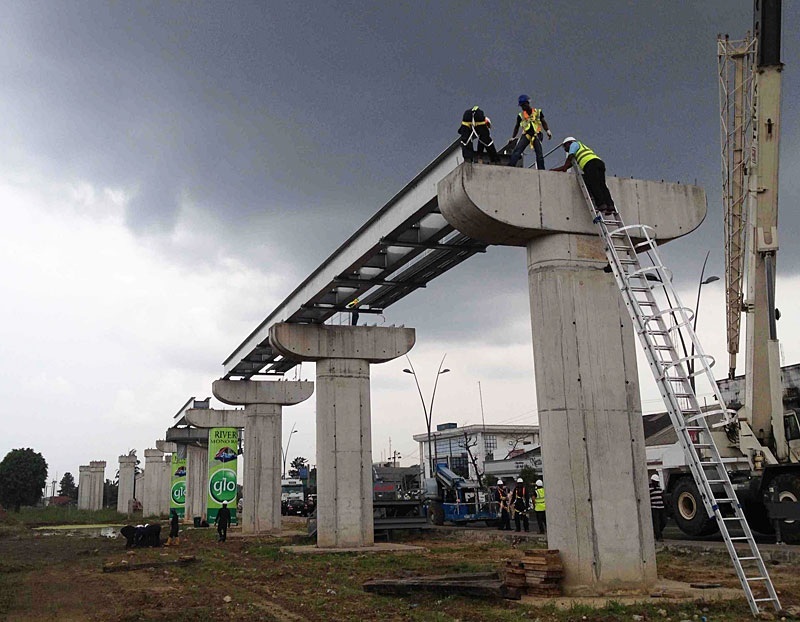 The Monorail Beam is elevated, supported by columns which in turn are supported by a foundation. The foundation will be properly sized to take all loads applied from the column to the foundation. The foundation and the beam structure shall be designed to a minimum life time of 50 years. The foundation shall be designed and built to withstand the local climate conditions at Port Harcourt including flood, thunderstorm, heavy rain, etc. Several trains will be in operation on the network between Aggrey Rd. and the loop North/East of the Garrison station. Plans outlined are projections and are subject to ongoing adjustment to achieve the best and safest quality to serve the city of Port Harcourt. The P30 for the Rivers Monorail in Port Harcourt, Nigeria has 6 cars. The capacity of each car is 35 passengers, with a total of 210 per train. Top speed is 80 km/h. Maximum gradient capability is 5%. The track dimensions are 1,200 X 800 mm. Average distance between support columns is 15 meters. 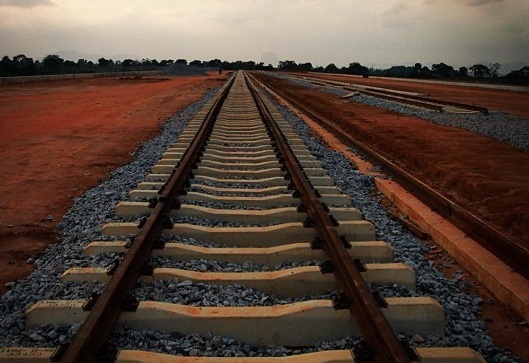 ABUJA — Federal Capital Territory Administration, FCTA, has assured on the completion of the N22.4 billion Abuja Light Rail project by 2015.